This Eppendorf 24-place centrifuge has been engineered to be extremely quiet. The Eppendorf 5425 speeds are designed for centrifugation steps of most routinely used DNA/RNA purification kits. During longer runs the cooling fan works at full capacity to dissipate the heat for the remainder of the run. Centrifuge 5425 is the successor of the legendary Centrifuge 5424. It has everything you loved before plus great new features to make everyday work more enjoyable. 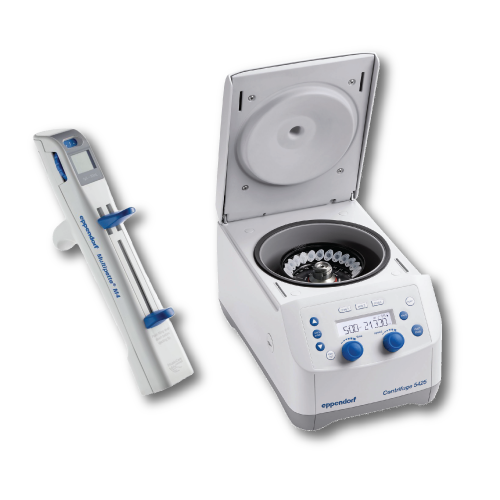 The Eppendorf Repeater M4 pipette is the ideal companion to the Centrifuge 5425 for high throughput work. With the ability to dispense up to 100 times from a single aspiration, the M4 pipette is perfect for any multi-dispensing application. And the M4’s positive displacement system with Eppendorf’s Combitips advanced improve accuracy with difficult liquids like viscous or foamy liquids.